Your Trickerion Shards gain a whole new gameplay significance with the Dahlgaard's Gifts expansion: they will unlock Power Card slots that allow you to customize your Magician by learning diverse abilities to enhance your game. As there are 90 different Power cards available, it will open up a multitude of new strategies and adds even more replayability to the game. 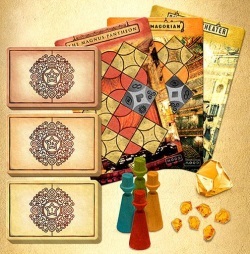 NOTE: This is an expansion for Trickerion: Legends of Illusion; you must have a copy of the original game to use this product. Add a Review for "Trickerion: Legends of Illusion – Dahlgaard’s Gifts"